When dealing with extreme pain, depression, loss, sadness, and circumstances you feel you have no control over, for some people self-harm becomes an outlet. However, it is a dangerous outlet for coping. The acts of self-injury are often misunderstood and thought of as suicidal. But, the definition of self-harm is "the deliberate, self-inflicted destruction of body tissue resulting in immediate damage, without suicidal intent and for purposes not culturally sanctioned." It includes the intentional cutting or carving of the skin, scratching, burning yourself, punching yourself or objects with the intention of hurting yourself, and embedding objects beneath the skin. It can be done to any part of the body, but most often is performed on wrists, hands, thighs and stomachs. Often places which can be hidden from view. It doesn't normally include piercings or tattoos, unless those are actually done for the purpose of injury. It is not done with the intent of committing suicide, but people who self-injure if the behavior continues, and the underlying reasons for the behavior go untreated, have a higher suicide rate. It sounds counterintuitive and counterproductive to hurt yourself while you are having trouble coping with big emotional or physical pain, but some people seek to self-injure as a way to take control back. They feel emotional pain ebb by replacing it with physical pain or create a physical pain they have control over, when other painful things in life become too much to bear. It can come from a dark spiral of self, a very lonely, guilt-ridden, and secretive place. Most people who self-mutilate hide their wounds, or lie about how they got them. It is a difficult subject for most people to admit to, as well as hard for other people to understand. It is confusing and painful. It can also be an extremely complex cycle to break free from. But there are survivors. Self-injuries, like all injuries, can heal, if given the chance, the support, and the understanding. Years ago, I met a beautiful, intelligent, powerful woman, Tommi Dubuque Johnstone, with a painful past and deep scars on her arms. The very first time I saw those long-healed slashes, I recognized them for what they were. I understood what she had done and the kind of dark place she had been in to do it, since I, too, had self-harmed. But the thing I found the most striking was the tattoo directly below her scars and the curve of her elbow. It said simply "Laugh". Upon seeing it, I asked her a single question, "Does it work?" pointing to the tattoo. Tommi replied bluntly, "All the time," and then she actually laughed. I always remembered that. A reminder to self to help survive and endure. I remember her honesty and bravery. The beauty of it was striking. I have known her for many years. I have watched with joy as her life found great love. (I toasted her at her wedding.) I have been proud of her success. (I toasted her promotions and chosen careers.) I have been moved by her art. (Poems which made me cry and cross-stitching which made me smile, one of which hangs in my house.) And, I have cheered for her genuinely deserved happiness. I watched Tommi fight to survive and win. I have watched her commitment to raise money and awareness to help others survive. Years later, I got a tattoo on my wrist. Which has many levels of meaning to me, both beautiful and hard, but one of the hidden meanings includes "Don't cut here." And I can tell you, it does work, all the time. Years after that, she drove from out of state to have lunch with me before my brain surgery and bought a "Team Drake" shirt with a little brain on it to support my survival. During the hardest parts of surviving, I have fought the urge to self-harm. I have not always been able to beat that urge back. I have faltered. I have cut and bled. But, I have often pulled myself back from the edge. 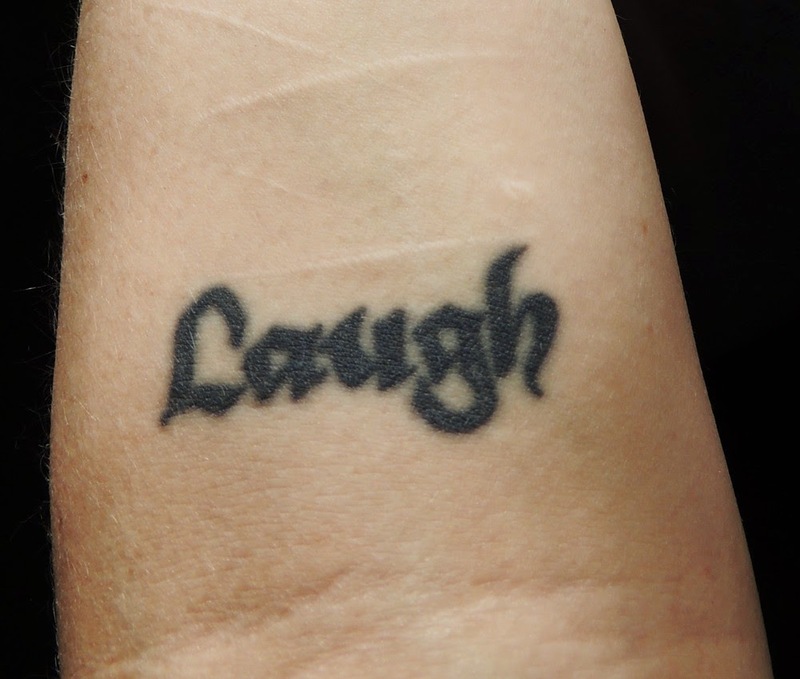 Stepped away from the abyss, by remembering her "Laugh" and by my own reminder on my wrist. Held on, by thinking of Tommi and another soul I have loved who self-harms, because in knowing their grace, beauty, and worth, I am able to find some of my own. There is power in knowing you are not alone. We all suffer. We all know darkness. We all have to fight for the light. We all have worth and value. We can all survive and endure. There is help. There is understanding. There is support. There are people like you. Seek a place inside of you that allows you to heal. Reach for people who can help you find that place. Remind yourself every day. You have worth and so does your life. Respect yourself and your skin. Laugh. It works. Seeking support and a deeper understanding of self-injury and depression beyond this site? To Write Love on Her Arms is a good place to start. (Writer's note: I respect all Survivors' privacy, but when I approached Tommi about this post, she said I could use her name and she sent me a picture of her inspiring tattoo. She also had some eloquent words to say on the subject which were very powerful, which I wanted to share, because they sum up so perfectly what it means to be a Survivor who Breathes Brave which is the root to what I am trying to do here at Survivor Jewelry. "I truly believe that keeping these sorts of things silent is damaging to our society, perpetuating the notion that self-mutilation is abnormal or freakish, encouraging people to keep their self-harm habits secret instead of seeking comfort and help, often letting the root cause go unnoticed and unaddressed for years or a lifetime. Because of this, I am extremely open about my own history of self-mutilation and I am honored to have you share a bit of my story here."